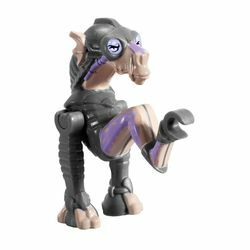 Sebulba is a Star Wars minifigure introduced in 1999, with a redesigned version included in the 2011 set 7962 Anakin's and Sebulba's Podracers. 1999 Variant- The first Sebulba minifigure was completely grey with no printing. It was only one piece, so there were no moveable parts. It was molded exclusively for the Dug species' shape and is exclusive to him. This version is exclusive to 7171 Mos Espa Podrace. Sebulba was a famous Dug Podracer pilot and one of Anakin Skywalker's competitors in the Boonta Eve Classic of 32 BBY. A renowned cheater, he pulled several dirty tricks in that race alone; deliberately ramming Mawhonic into a cliff face, using an illegal flamethrower to destroy Clegg Holdfast's podracer, tossing a metal tool into Mars Guo's air intakes, and sabotaging Anakin's engine pod before the race. Despite the sabotage, Anakin persisted in challenging him for the lead, and after several attempts to ram him off the track, Sebulba's podracer finally got hooked up on the boy's. The damage caused Sebulba's power couplings to fail and destroyed his podracer. Sebulba himself survived. Never one to miss an opportunity for glory, he then purchased Anakin's podracer after the race and immediately resumed his notorious career. This page was last edited on 10 January 2016, at 00:25.